Gentle Giant has taken the retro fad to new heights -- literally. Gentle Giant's Jumbo Vintage Kenner Star Wars action figures are blown up versions of Kenner's original 4-inch Star Wars toys. 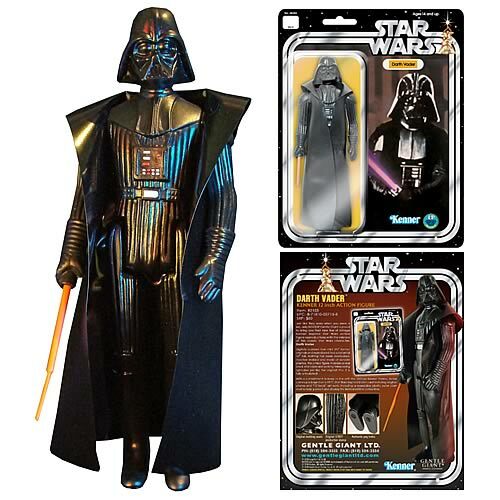 Gentle Giant's Jumbo Darth Vader stands at 12-inches -- three times the size of the original Kenner action figure. The first jumbo release was Boba Fett who will soon be joined by Luke Skywalker, Princess Leia, Han Solo, Chewbacca, Darth Vader, Obi-Wan Kenobi, a Tusken Raider and a Jawa. The figures sell for approximately $75, but if you take advantage of Entertainment Earth's current Gentle Giant BOGO Sale, you can score a second figure for 50% off. Add two Gentle Giant products to your cart and Entertainment Earth will automatically deduct 50% off the cost of the lower priced item. The figures will be rolling out over the course of the next 9 months, which means you can pre-order now, get the discount and you won't be charged until the items ship.